Chester County is well known for its historic buildings, villages, hamlets, and landscapes that reflect and date back to our nation's 18th century founding and early settlements. This web page provides information on Town Tours and Village Walks, historic preservation planning, and historic properties. 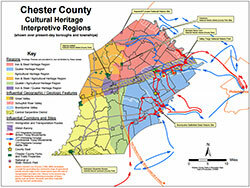 Technical assistance regarding historic resources, preservation, and interpretation is available to the public, municipalities, partners, and others interested in the historic resources and heritage of Chester County. Learn more. Town Tours and Village Walks is a series of free summer strolls through historic neighborhoods, hamlets, villages and sites. Check back in spring for the 2019 schedule! Since 2009 funding by the American Battlefield Protection Program and in partnership with the Brandywine Battlefield Task Force, the Planning Commission has been undertaking local and regional planning efforts through studies, interactive mapping, and plan documents related to the Campaign of 1777. Learn more about the Campaign of 1777. The Schuylkill Highland's and Hopewell Big Wood's region of Chester, Berks, Montgomery, and Lancaster counties can boast the longest history with the iron and steel industry in our nation. This region of America literally 'forged the nation', encompassing 300 years of industrial sites that reflect the contrast between the technological advances and rural way of life and landscapes of the region. Learn more. The purpose of the Underground Railroad Freedom Trail is to continue the over 200 mile Harriet Tubman Scenic Byway through southern Chester and Delaware counties in Pennsylvania to Independence Mall in Philadelphia. Learn more. In 2004, an update to the original Chester County Historic Sites Survey (1978-1982) using a Geographical Information System was initiated. This initiative is a partnership between the Planning Commission, Chester County Historic Preservation Network, and the municipalities. Learn more. Landscapes3 is the comprehensive plan for Chester County, and renews the county's commitment to balancing growth and preservation to foster vibrant communities. Landscapes3 is organized around six goal areas: Preserve, Protect, Appreciate, Live, Prosper, and Connect, and addresses land use, growth, and preservation as part of the Landscapes Map. Historic preservation is addressed primarily within the Appreciate goal area of Landscapes3, with additional discussion as part of the Landscapes Map and within Preserve. As one of three original counties founded by William Penn, Chester County enjoys a rich and vitally important role in the development of this country. The interpretation and preservation of historic structures, landscapes and other resources at the County level is a collaborative partnership of the Chester County Planning Commission, the County Archives & Records Services Department, and Chester County Facilities & Parks. Learn more. Various issues and trends impact historic preservation and interpretation, in both positive and negative ways. View more detail on issues and trends, as well as links to more resources. Historic resources planning is most successful when people and groups with varying expertise work together and share ideas and their specific skill sets in a collaborative manner. View a list of our partner agencies.